PLEASE SIGN MY GUESTBOOK AND SAY ANYTHING YOU WANT TO ABOUT GRAND FUNK OR MY LITTLE WEBSITE! I found some videos of GFR\'s concerts but none as good as this one was.. I was unable, as of today, to find a video or a film of this fantastic concert.. Does anyone get one copy or can help me to find one?? I was a senior in high school when I attended "Berlin Airlift" at RFK Stadium in D.C. and was thrilled to see Grand Funk. My friend seated next to me and I were among the hoards that rushed the stage. Occasionally I like to shock my middle aged business colleagues by telling them about the time a girlfriend and I unsuccessfully tried to throw ourselves at Mark Farner! They gave a great performance and that all day concert is one of my fondest memories from high school. I saw grand funk the first time at the Berlin airlift concert held at the rfk stadium in washinton dc.the show was flat out from beginning to end.fans rushed towards the stage and didn't want to leave,until terry knight said the band would stop playing if they didn't go back to the bleachers!I have seen grand funk as the 3 piece and when they had Craig join..grand funk was the most powerful band I ever heard in those days.just 3 guys, awall of west amps and a drum set. I found a west grande amp which I have kept since the seventies. Lots of memories ! The really early GFRR concerts in 1969 and 1970 were the best and most energetic to see. 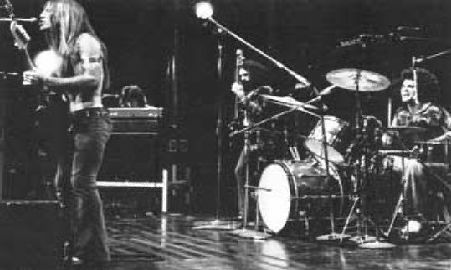 They became more polished as musicians and vocalists later in the mid- seventies, but I still favor the raw, frenzy concerts they first played. You see, the only way to make it way back then was to tour, tour, and tour- no videos or MTV to skate on then. The early concerts were," No Frills" at all. Mark, Don and Mel came out smiling, ready to play. On the first note, Mark was several feet in the air- the whole crowd rushed the stage as fast as they could run up front, including the fans in the far back. Mark was running, jumping, galloping all over the stage, while singing, playing guitar and harmonica. The crowd was screaming, jumping up and down, and just going crazy with this wild kind of concert that no one had seen before. It didn't stop for the whole concert, and neither did Mark. GFRR just kept turning up the energy and intensity. Every song was bigger and harder and heavier and faster than the last , with the exception of, "Heartbreaker" ,and "Mean Mistreater", and just like the "Live Album", you could here a pin drop on these softer songs. Mark was playing incredible leads and vocals, while putting on these one of a kind concerts. Fans stood up for the whole concert, screaming ,yelling and cheering, jumping up and down, just going crazy for these excellent performances. Seeing quite of few of these, they were pretty much the same, just blowing the fans away with their brand of new hard rock , as a trio, kinda heavy psyche and garage band , before becoming more top 40 or a little more pop style later on. This kind of intensity and extreme energy just couldn't go on forever, although we thought it would at the time, because we knew what would happen at a GFRR concert. Alas, I took every friend, girlfriends to a big GFRR concert and had front row seats for all. Mark came out front and the band began to play like a normal rock and roll band, not as animated, and not jumping and vaulting and cavorting about as he had done so many times before. My friends were staring at me- I didn't know what to say to them -I was just stunned that it wasn't the same wild crazy concert situation that it was before- Now, it was a great concert, but couldn't compare to the real early concerts that had made their reputation so solidly for them. That era had passed so quickly, and I was so honored to see it and be a part of it, and so very lucky, indeed. Later on, we found out that Mark just couldn't continue on with those breakneck speed concerts. It was effecting his health, and he was sometimes collapsing after concerts. He was too valueable to lose at such a young age, so things had to change. If I had not seen the frenzy concerts, seeing the later ones would have been perfect. Most people didn't see those, because they were just starting out making a name for themselves. I still think Mark, Don, and Mel were one of the best, if not the best bands I ever saw, and I went to hundreds of concerts. Thank You Mark Farner for your great concerts all these years, and for your endless dedication, and for hanging in there for decades for your fans. I know I'll never forget it. Surfing for Grand Funk info & pics - yours is a goldmine website. It's so great to read other people's enthusiasm, I've always been alone with Mark Don and Mel! I saw GFR two nights in a row at the Forum in Los Angeles 1970 I think - GFR opened for Black Sabbath and it should have been the OTHER WAY AROUND. They rocked WAY HARD. After the concerts I saw an 8x10 black and white of Mark at a friend's house; another guy had taken it from the pit. He gave it to me and I had it autographed a few years ago here in Sacramento when Mark was touring! I'm recently obsessed with listening to their old stuff. I'm looking for any video and pictures of the power trio especially. Bless you Mark, Don and Mel! I grew up in Michigan. One night in 69 I went to see a friend who went to school at MSU. There was a band playing at a mixer in the dorm. It was Grand Funk Railroad! I didn't know who they were but ehy had just split with Terry Knight and man they rocked!!! As a 9 year old, I would here "Closer to Home" on my older brother's radio, I thought they were a cool group. But early in 72' when they released Mark, Don & Mel, my brother (again) bought the album and from that point we both listened to it (as we pretended to do homework most of the time), and with my bother having a paper route he had money so he proceded to buy GFR's earlier albums, I was the lucky recipient of being in the same room where he blasted his stereo by then and have remained a GFR fan since. Thanks Omnivoid, this is alright and has great info. Its all about my Rock n Roll Fantasies! email me if ur interested ok? The First Time I Heard Them Was When I was 11, It was a hot summer day and I was in my room With The breeze blowin. I was half asleep and my radio was Loud! and i remember hearing Im your captain\closer to home and I was toatlly influenced It was nothing I ever heard!!! It was so amazing it was like magic. and for 2 years I forgot who they were then at school My teacher turned on the radio and there it was and i seriously dropped to my knees! I was that grateful! Closer to my home Is the best Song!! Grand Funk - On Time! U.S. copy of that album including intact poster. I just bought all their albums, man. live as I was always in the wrong places at the wrong time! Nice site. I had'nt ever seen this one before! if you're interested. thanks a lot. hitchhiked to atlanta pop festival in 1969,i was just 16. they blew the crowd away on friday and again on saturday. still can't believe i was there. saw them again in 69 at west palm pop fest. I saw Grand Funk Railroad in either 1968 or 1969 at Mount Holly in Holly Michigan. I stood less than 6 feet from Mark. He had tape on his Messenger guitar covering the "F" holes. So much for only playing just the large festival circuits. I bought the On Time album shortly after seeing them.I walked past the doorman, who was checking ID's, just like I belonged there. Pretty good for a 17 year old. I like the picture of the bridge in Flint. Been by there many times. I first saw GFR w/ my mom at Cal State LA (in the lunch room) sometime during the mid to late sixties (I was about 8 yrs old). During the set break I walked up and asked one of the members if they were The Doors; they all laughed and said no we are a little band called "grand funk railroad". I was disappointed caused I loved The Doors but now I am honored to have met and seen a legend like GFR before anyone knew who they were. where can we find some old video?